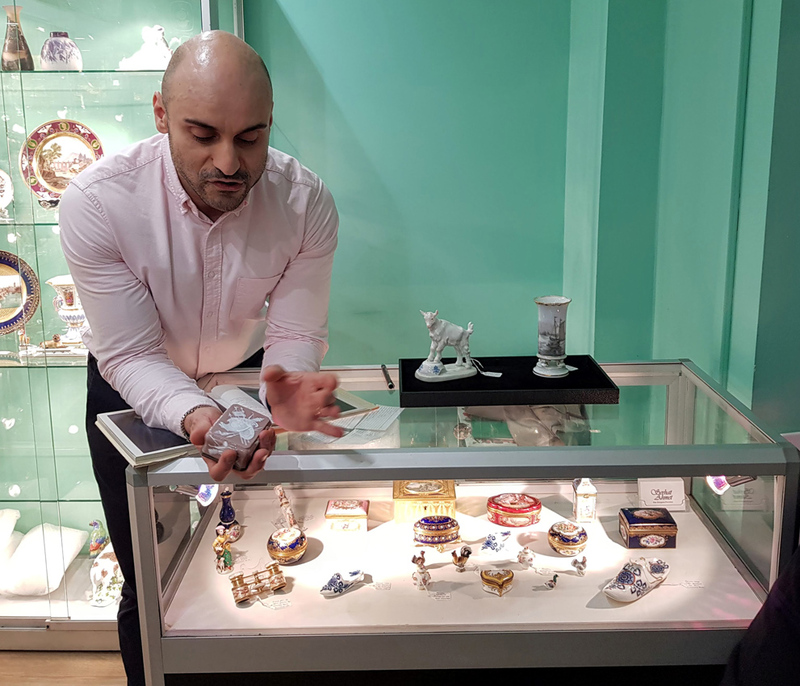 Tips on how to spot and understand Art Nouveau and Art Deco Meissen porcelain was the focus of a recent BADA Friends event with Serhat Ahmet, a second-generation dealer in fine European porcelain. He hosted two groups at his space in Grays Antiques, giving a brief history of the period, which includes some of the rarest and most experimental pieces in the factory’s history. 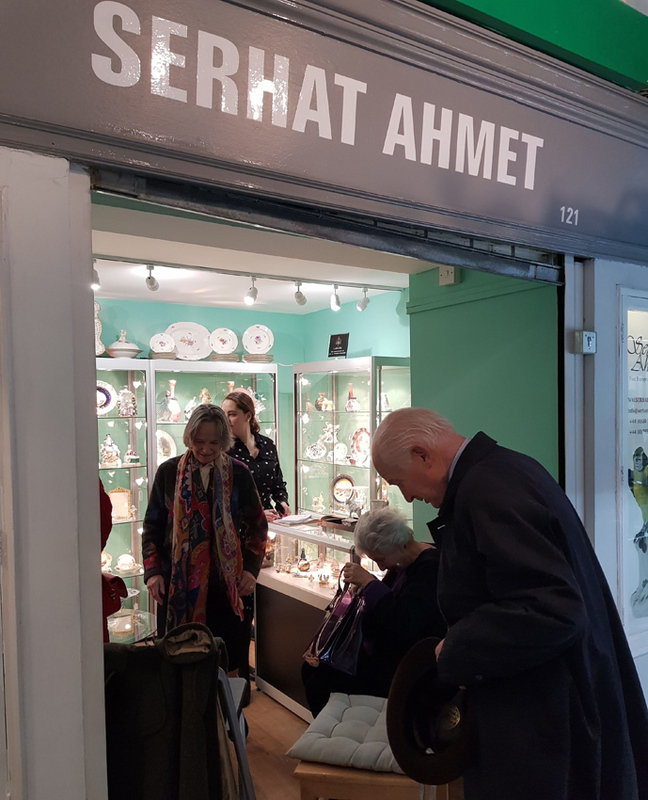 Serhat Ahmet’s space at Grays Antiques. 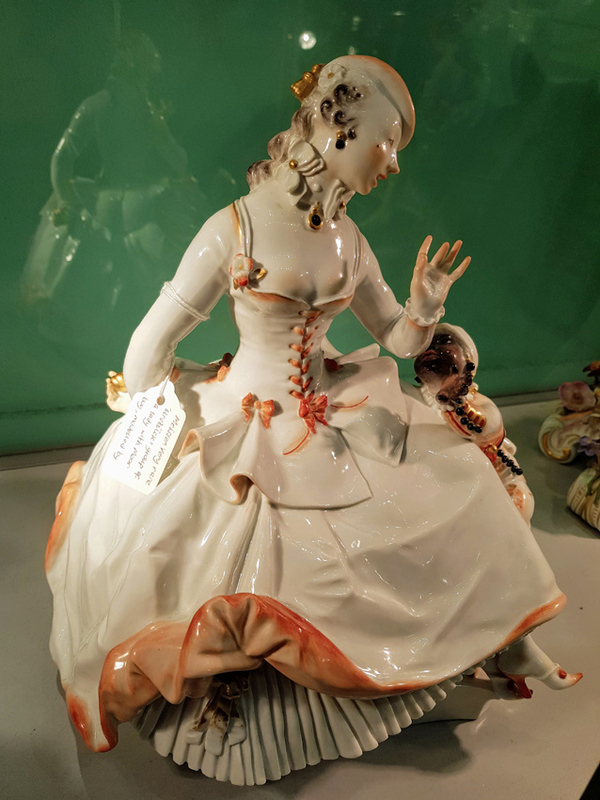 Founded in 1710, Meissen china was the first European porcelain to be developed and was a venerable company when it started experimenting with new techniques and decorations in the 1870s. It had long been owned by the King of Saxony (the crossed swords mark is based on the arms of the Elector of Saxony), but passed into the control of the state in 1831, and generally focused on producing ‘antique’ figures and forms that recalled it Baroque origins. 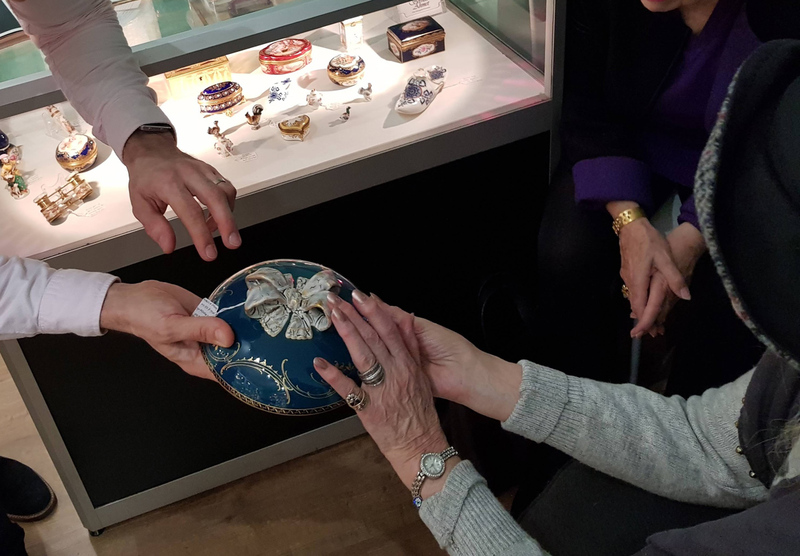 Under growing competition from other factories such as Sevres and Berlin, however, Meissen started experimenting. By the Paris Exposition of 1900, it had started producing Art Nouveau pieces. The state, however, encouraged the factory to focus on its traditional pieces, and the more experimental examples made up only a fraction of the display – though these proved highly popular. 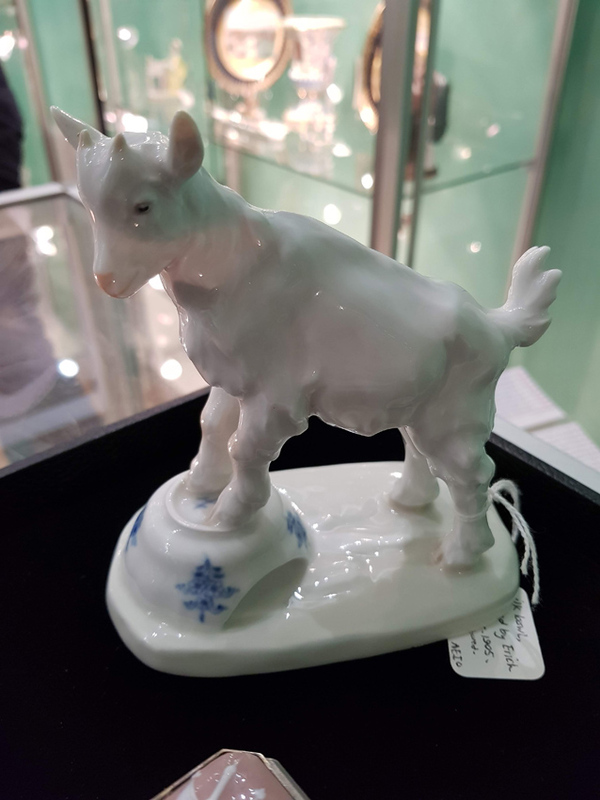 Among the experimental techniques Meissen used during its Art Nouveau period was the use of underglaze on figures such as this goat from 1905. When the factory later returned to producing works sympathetic to its earlier ‘antique’ pieces, its Art Nouveau productions were seen as a step away from its origins and legacy and much of the history from this period was disregarded or lost. Making matters more difficult for modern admirers of the period, pieces produced by Art Nouveau and Art Deco practitioners were often produced as experimental one-offs, in small editions and were sometimes not recorded. Although these are two completely different forms of decoration, both were important as Meissen started to experiment. Paste-on-paste allows for the creation of relief design by applying layers of white porcelain on a piece before firing. Use of underglazes – including its application to figures and its combination with overglaze decoration – would continue well into the 20th century. This rare Art Deco Urstück group of a lady holding a golden ball behind her back is signed and dated by Scheurich for 1921. It is among the pieces discussed at Serhat Ahmet's recent BADA Friends event. This group of a lady holding a golden ball behind her back in her right hand with a boy appealing for her to return it was first modelled by Paul Scheurich (1883-1945) in 1919. It was executed in three colour forms: white, orange and gold and polychrome. This orange and gold example was signed and dated for 1921. It was decided in 1918 that the first 11 models of new sculptures of particular aesthetic value ‘will be made under the particular supervision and with the collaboration of the artist whose signature they will bear and will be sold accordingly at a higher price’. The group in question is impressed von11Ur= STÜCKEN Nr 4, to indicate that this was the fourth of the first 11 models of this group made under the guidelines described above. The Meissen factory is still in operation today, producing many of its beloved, traditional pieces. The biggest market for its current productions is in Taiwan so it’s not surprising those buyers have started looking out for fine antique examples too. In some cases, the older examples are actually more affordable. Collectors of Art Nouveau and Art Deco examples are primarily found in Japan, Germany and the UK.